Stansbury’s Mackenzie Landward (right) gets her foot on the ball to score the first of her two goals during the first half of Monday’s Region 11 girls soccer game against Juan Diego at Stansbury High School. Juan Diego won the game 5-3. 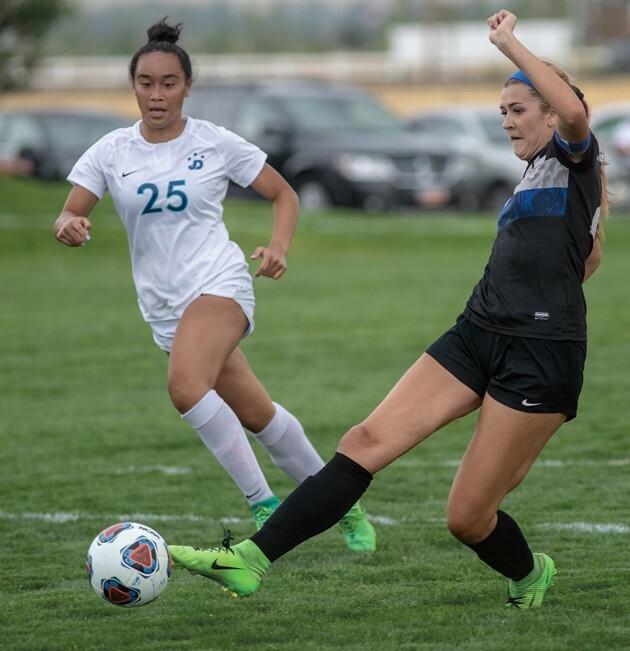 The Stansbury girls soccer team returned to its home field Monday afternoon, looking to get Region 11 play off to a good start against a tough Juan Diego squad. 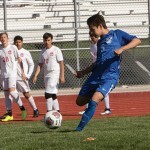 While the result wasn’t what the Stallions wanted — a 5-3 loss to the visiting Soaring Eagle — it was a strong effort nonetheless, as Stansbury never let Juan Diego run away with the game, a marked improvement from last year’s season-opening blowout loss. Stansbury (2-3, 0-1 Region 11) struggled to slow down Juan Diego’s Daviana Vaka, whose deceptive shot wreaked havoc on the Stallions’ defense. 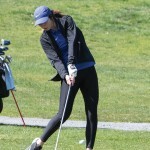 Vaka scored four goals for the Eagle (2-1, 1-0), giving her six of her team’s seven tallies on the season. Vaka’s first tally came on a blast from the right wing in the 29th minute that put Juan Diego in front 1-0. Stansbury got a quick response as Mackenzie Landward converted on a through ball from teammate McCall Littlefield in the 31st minute, and a turnover in the 38th minute led to another Landward goal off a feed from Maddy Graber and a 2-1 Stansbury lead. But that’s when Vaka found another gear. Almost immediately after the ensuing kickoff, Vaka scored the game-tying goal to forge a 2-2 halftime tie. In the 51st minute, she completed her hat trick and put Juan Diego back in front, and then added a fourth goal in the 66th minute. To their credit, the Stallions didn’t go away after finding themselves down by two goals. A corner kick in the 71st minute got Stansbury right back in the game, as Littlefield found Reagen Didericksen at the back post to pull the Stallions within a goal. Stansbury then increased its offensive pressure in an effort to get the game-tying tally, but it wasn’t to be, as Juan Diego regained possession and Kate Keil scored with two minutes left to give the Soaring Eagle an important insurance goal. 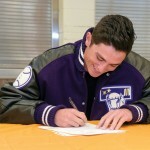 Stansbury won’t get much opportunity to rest before another tough Region 11 test. The Stallions travel to Ogden on Wednesday for a matchup against the Ogden Tigers, one of the region’s four postseason participants a year ago.